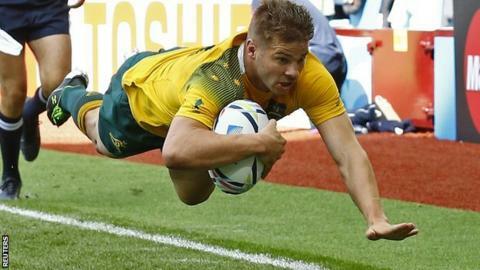 Australia went top of Pool A as they ran in 11 tries against Uruguay in the biggest win of the 2015 World Cup so far. Flankers Sean McMahon and Ben McCalman both crossed twice, as did winger Drew Mitchell at a near-capacity Villa Park. There were also tries for right-wing Joseph Tomane, lock Dean Mumm, centres Henry Speight and Matt Toomua and replacement Tevita Kuridrani. Uruguay's sole response was a penalty from stand-off Felipe Berchesi. They were spared a bigger beating by the kicking of Aussie stand-off Quade Cooper who, as well as being shown a yellow card, missed six of his 11 pots at goal. Australia, who face England in a key Pool A match at Twickenham next Saturday, made 14 changes following Wednesday's opening 28-13 win over Fiji. Having missed out on a bonus point in their opening game by only scoring three tries, Australia ensured they avoided a repeat by crossing the line five times before the break. Other than the hiccup of Cooper's third yellow card inside two months, it was plain sailing for the Aussies. They led 31-3 at half-time after five first-half tries - and added another six after the break. Uruguay had a one-man advantage for 10 minutes when Aussie fly-half Cooper was sin-binned for a high challenge on opposing scrum-half Agustin Ormaechea. This was his third yellow card in international rugby in as many months, having also suffered the same fate against Argentina in July and New Zealand in August. The South Americans took advantage with a Berchesi penalty. But, as soon as Cooper had returned to the pitch, the Aussies started running up the tries again - with three more in nine minutes as Uruguay's 'tries against' count, which started with eight from Wales in Cardiff a week ago, reached 19. They finished the game camped on the Aussie line, roared on by the neutrals (and judging by the outbreak of Swing Low, Sweet Chariot, there were a lot of them). But they could not get through and, instead, it was the Aussies who had the last word. Australia flanker Sean McMahon. He scored the first try of the game when he wheeled round the back to dive over from close range. He was then involved in creating Joseph Tomane's second and then got on the scoresheet again after the break. Australia: Beale, Tomane, Speight, Toomua, Mitchell, Cooper, Phipps, Sio, Polota-Nau, Smith, Mumm, Skelton, McCalman, McMahon, Palu. Replacements: Kuridrani for Toomua (78), Douglas for Skelton (57), Simmons for Palu (46). Not Used: Moore, Kepu, Holmes, Genia, Foley. Uruguay: Mieres, Leivas, Prada, A. Vilaseca, Silva, Berchesi, Ormaechea, Sanguinetti, Kessler, Sagario, S. Vilaseca, Lamanna, De Freitas, Beer, Gaminara. Replacements: Roman for A. Vilaseca (73), A. Duran for Sanguinetti (54), Arboleya for Kessler (46), Klappenbach for Sagario (54), Magno for Lamanna (56), Nieto for De Freitas (56), Bascou for Gaminara (71). Not Used: O. Duran.